However, Dow Jones recouped all the losses and jumped 135 points as Bernanke said the recovery is likely to improve in the 2H11, and he reassured investors and the public that U.S. growth is safe in the long run. Bernanke said the FOMC would consider its options at its next meeting on 21 September. After staging a commendable 4.3% rebound last week, Wall Street will be heading for another challenging week ahead of the Labor Day holiday weekend on 5 September), marked by the effects of Hurricane Irene and anticipation over the upcoming economic figures i.e. July consumer spending (29 August); August ADP job data (31 August); Aug ISM (1 September) and August jobs report (2 September). While August is still setting up as a lousy month for Dow Jones(-7.1%), last week’s strong rebound may have removed the fear of a further free fall. If the Dow Jones can record another weekly gain this week, the Dow is expected to see brighter days ahead. 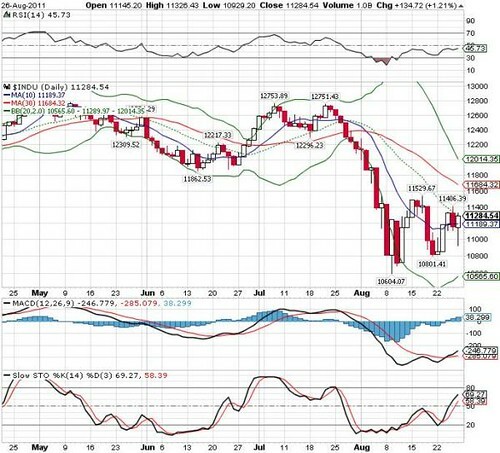 Technically, positive indicators and a close above the 10-d SMA could spur further upside to retest weekly resistance at 11530 (17 Aug high) and 11684 (30-d SMA) levels). 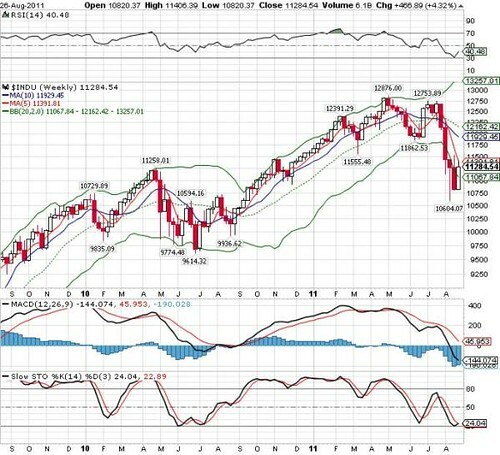 Weekly supports are situated near 10801-11000.